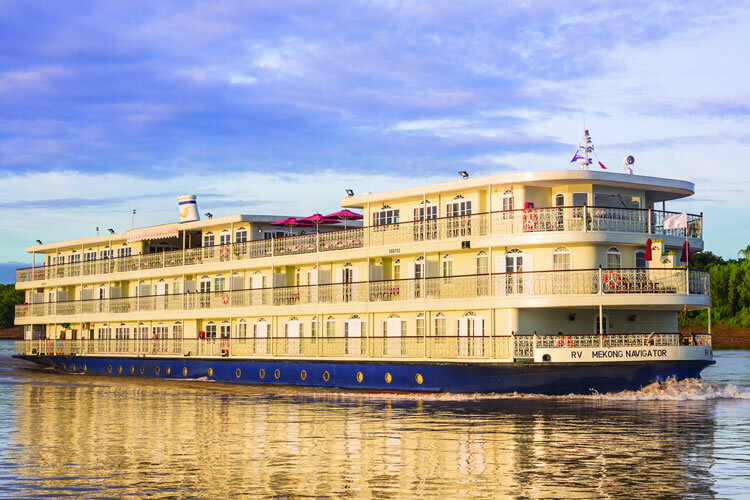 Traverse the culturally colourful destinations of Hanoi and Ho Chi Minh City before you take to the mighty Mekong for seven nights on-board the Mekong Navigator. See Southeast Asia from an enchanting vantage point, as your fascinating journey continues into Cambodia, an inspiring landscape of temples and traditions tells tales of this country’s engaging spiritual heritage. Fly from London Heathrow or Manchester overnight. Discover More: Uncover the outer lying temples, either Banteay Srei or Beng Mealea, or take a Cambodian cooking class, or explore the Roluos temple group (additional cost). Cambodia’s capital Phnom Penh was once known as the “Pearl of Asia”, but it was almost entirely evacuated by the Khmer Rouge in 1975. Today it is an inspiring and buzzing centre of hope and opportunity with plenty to see and do. EmeraldPLUS: After breakfast, we meet our cyclo drivers for an exciting morning city tour of Phnom Penh. Cyclos, a Phnom Penh institution are three wheeled bicycles built for transporting passengers. They are a traditional mode of transport throughout the Mekong and provide a unique view of the capital. Prepare for a leisurely journey as we are taken along the riverfront to the magnificent Royal Palace complex which is a highlight of any visit to Phnom Penh. Enjoy a leisurely walk through the grounds, viewing Throne Hall and Moonlight Pavilion before visiting the famous Silver Pagoda, home of Cambodia’s Emerald Buddha and Maitreya Buddha, encrusted with more than 9,000 diamonds. The cyclos then transport us to the National Museum, ending the morning with a comprehensive tour of the many Angkorian and pre-Angkorian artifacts discovered in the Angkor Archeological Area in Siem Reap. The afternoon is at leisure to explore Phnom Penh. Go shopping at the local markets, or simply relax at one of the many restaurants and pubs such as the famous Foreign Correspondents Club. EmeraldPLUS: Before dinner, visit the Sun Deck to enjoy a cultural performance by the Cambodian Children’s Group. The performance includes Apsara, Cambodia’s national dance as well as local traditional folk dances. This morning we learn about the darkest days of Cambodian history. A short drive will take us to the Killing Fields at Choeung Ek which is a disconcerting reminder of the recent atrocities committed by the Khmer Rouge regime. We have the opportunity to walk through the fields, visit the small museum and Memorial Stupa, and learn about this sad history. We continue to what is possibly the most powerful museum experience in Indochina, Tuol Sleng Genocide Museum (also known as S-21). This is a former school that was converted to the main prison and torture headquarters of the Khmer Rouge and is a chilling reminder of the brutal history. Our afternoon is again at leisure. Cruise toward the border. Following clearing formalities and crossing the border, we witness a fascinating change in the architecture along the riverfront as we sail into Vietnam. Xin Chao and welcome to Vietnam! 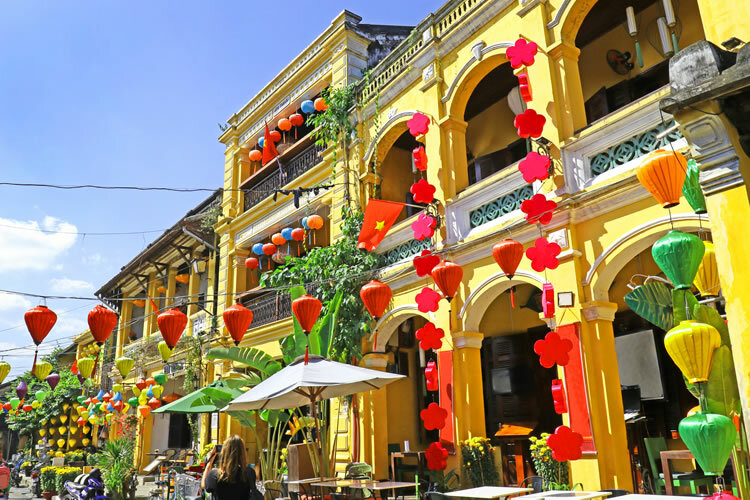 Tan Chau is an interesting border town with a variety of ethnicities and is famous for its silk. Board a sampan and sail to a colourful temple of the Cao Dai religion. This is one of the unique amalgam religions founded in Vietnam and its unique cast of saints include Jesus Christ, Sun Yat Sen and Victor Hugo. We then board a xe loi (traditional Vietnamese tuk-tuk) for a 15-minute ride through the town to a family-owned mat weaving workshop. This is a fascinating look into an integral Mekong Delta industry where the products are made by hand or with the help of a manually operated loom. Reboard our sampans and sail to a floating fish farm to learn about various types of fish in this region and the importance of this industry to Vietnam’s economy. Disembark at Evergreen Island for a walk through the local village which provides an interesting view into authentic rural Mekong Delta life. This evening join the culinary team and watch them demonstrate the art of Vietnamese and Cambodian cooking. Transfer to the airport for your flight to the fomer Vietnamese imperial capital, Hue. Spend the afternoon soaking in this historic city. EmeraldPLUS: Live like an Emperor and dress up in royal costume for an Imperial banquet. Take a walking tour and see old merchants houses, the Japanese Covered Bridge and Assembly Hall of the Chinese Congregation. EmeraldPLUS: Join the Lifestart Foundation that assists the underprivileged in becoming self-sufficient. Visit a local painter who will teach you the art of Vietnamese painting and afterwards, enjoy a lantern making class. Transfer to Danang airport for your flight to Hanoi. On arrival, travel to picturesque Halong Bay and board your luxurious traditional style junk. Cruise through the bays and islets enjoying the stunning scenery of this magnificent region. Visit Dark and Bright Lagoon, a spectacular lagoon accessed by passing under a natural tunnel. Opportunity to view this spectacular landscape from the air with a 45 minute seaplane flight from Hanoi over Halong Bay (must be pre booked, additional cost). Disembark and bid farewell to the RV Mekong Navigator and her crew. Transfer to Siem Reap, the gateway to the magnificent Temples of Angkor. EmeraldPLUS: This evening witness the incredible Phare Cambodian Circus, a spectacle of acrobatics, theatre and music. Phare is an NGO founded by Cambodian refugees to assist disadvantaged young people by teaching them performing arts. This morning visit historic Ho Chi Minh Mausoleum (view from outside) and see Ho Chi Minh’s former home, then the iconic One Pillar Pagoda. Continue to the Temple of Literature, Vietnam’s first university, then take a walking tour through Hanoi’s historic Old Quarter. meraldPLUS: Attend a traditional Water Puppet performance then go backstage to meet the puppeteers. Finish with a farewell dinner at a local restaurant. It’s time to say your goodbyes and transfer to Hanoi airport for your homeward flight.. Terms and conditions apply, all offers are subject to availability and operator booking conditions. ^Itinerary operates in reverse. All savings are included in the fares shown and were correct at time of print, but are subject to change. Fares are per person based on 2 people sharing the lead in grade stateroom unless otherwise stated. *Savings are valid to new bookings only. We charge a one-off small £20 booking fee. That’s it - nothing more and no add ons when you pay the balance. E&OE. ABTA P6710.